The enzyme cytochrome c oxidase or Complex IV, EC 1.9.3.1 is a large transmembrane protein complex found in bacteria and the mitochondrion of eukaryotes. It is the last enzyme in the respiratory electron transport chain of mitochondria (or bacteria) located in the mitochondrial (or bacterial) membrane. It receives an electron from each of four cytochrome c molecules, and transfers them to one oxygen molecule, converting molecular oxygen to two molecules of water. In the process, it binds four protons from the inner aqueous phase to make water, and in addition translocates four protons across the membrane, helping to establish a transmembrane difference of proton electrochemical potential that the ATP synthase then uses to synthesize ATP. 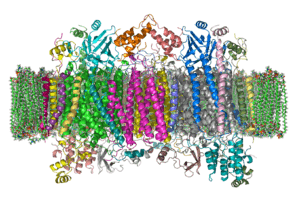 The complex is a large integral membrane protein composed of several metal prosthetic sites and 14  protein subunits in mammals. In mammals, eleven subunits are nuclear in origin, and three are synthesized in the mitochondria. The complex contains two hemes, a cytochrome a and cytochrome a3, and two copper centers, the CuA and CuB centers. In fact, the cytochrome a3 and CuB form a binuclear center that is the site of oxygen reduction. Cytochrome c, which is reduced by the preceding component of the respiratory chain (cytochrome bc1 complex, complex III), docks near the CuA binuclear center and passes an electron to it, being oxidized back to cytochrome c containing Fe3+. The reduced CuA binuclear center now passes an electron on to cytochrome a, which in turn passes an electron on to the cytochrome a3-CuB binuclear center. The two metal ions in this binuclear center are 4.5 Å apart and coordinate a hydroxide ion in the fully oxidized state. Crystallographic studies of cytochrome c oxidase show an unusual post-translational modification, linking C6 of Tyr(244) and the ε-N of His(240) (bovine enzyme numbering). It plays a vital role in enabling the cytochrome a3- CuB binuclear center to accept four electrons in reducing molecular oxygen to water. The mechanism of reduction was formerly thought to involve a peroxide intermediate, which was believed to lead to superoxide production. However, the currently accepted mechanism involves a rapid four-electron reduction involving immediate oxygen-oxygen bond cleavage, avoiding any intermediate likely to form superoxide. COX assembly in yeast is a complex process that is not entirely understood due to the rapid and irreversible aggregation of hydrophobic subunits that form the holoenzyme complex, as well as aggregation of mutant subunits with exposed hydrophobic patches. COX subunits are encoded in both the nuclear and mitochondrial genomes. The three subunits that form the COX catalytic core are encoded in the mitochondrial genome. Hemes and cofactors are inserted into subunits I & II. Subunits I and IV initiate assembly. Different subunits may associate to form sub-complex intermediates that later bind to other subunits to form the COX complex. In post-assembly modifications, COX will form a homodimer. This is required for activity. Both dimers are connected by a cardiolipin molecule, which has been found to play a key role in stabilization of the holoenzyme complex. The dissociation of subunits VIIa and III in conjunction with the removal of cardiolipin results in total loss of enzyme activity. Subunits encoded in the nuclear genome are known to play a role in enzyme dimerization and stability. Mutations to these subunits eliminate COX function. Assembly is known to occur in at least three distinct rate-determining steps. The products of these steps have been found, though specific subunit compositions have not been determined. Synthesis and assembly of COX subunits I, II, and III are facilitated by translational activators, which interact with the 5’ untranslated regions of mitochondrial mRNA transcripts. Translational activators are encoded in the nucleus. They can operate through either direct or indirect interaction with other components of translation machinery, but exact molecular mechanisms are unclear due to difficulties associated with synthesizing translation machinery in-vitro. Though the interactions between subunits I, II, and III encoded within the mitochondrial genome make a lesser contribution to enzyme stability than interactions between bigenomic subunits, these subunits are more conserved, indicating potential unexplored roles for enzyme activity. Two electrons are passed from two cytochrome c's, through the CuA and cytochrome a sites to the cytochrome a3- CuB binuclear center, reducing the metals to the Fe2+ form and Cu+. The hydroxide ligand is protonated and lost as water, creating a void between the metals that is filled by O2. The oxygen is rapidly reduced, with two electrons coming from the Fe2+cytochrome a3, which is converted to the ferryl oxo form (Fe4+=O). The oxygen atom close to CuB picks up one electron from Cu+, and a second electron and a proton from the hydroxyl of Tyr(244), which becomes a tyrosyl radical: The second oxygen is converted to a hydroxide ion by picking up two electrons and a proton. A third electron arising from another cytochrome c is passed through the first two electron carriers to the cytochrome a3- CuB binuclear center, and this electron and two protons convert the tyrosyl radical back to Tyr, and the hydroxide bound to CuB2+ to a water molecule. The fourth electron from another cytochrome c flows through CuA and cytochrome a to the cytochrome a3- CuB binuclear center, reducing the Fe4+=O to Fe3+, with the oxygen atom picking up a proton simultaneously, regenerating this oxygen as a hydroxide ion coordinated in the middle of the cytochrome a3- CuB center as it was at the start of this cycle. The net process is that four reduced cytochrome c's are used, along with 4 protons, to reduce O2 to two water molecules. COX exists in three conformational states: fully oxidized (pulsed), partially reduced, and fully reduced. Each inhibitor has a high affinity to a different state. In the pulsed state, both the heme a3 and the CuB nuclear centers are oxidized; this is the conformation of the enzyme that has the highest activity. A two-electron reduction initiates a conformational change that allows oxygen to bind at the active site to the partially-reduced enzyme. Four electrons bind to COX to fully reduce the enzyme. Its fully reduced state, which consists of a reduced Fe2+ at the cytochrome a3 heme group and a reduced CuB+ binuclear center, is considered the inactive or resting state of the enzyme. Cyanide, azide, and carbon monoxide all bind to cytochrome c oxidase, thus competitively inhibiting the protein from functioning by preventing the binding of oxygen at the active site, which results in the chemical asphyxiation of cells. Higher concentrations of molecular oxygen are needed to compensate for increasing inhibitor concentrations, leading to an overall reduction in metabolic activity in the cell in the presence of an inhibitor. Other ligands, such as nitric oxide and hydrogen sulfide, can also inhibit COX by binding to regulatory sites on the enzyme, reducing the rate of cellular respiration. Cyanide is a competitive inhibitor for COX, binding with high affinity to the partially-reduced state of the enzyme and hindering further reduction of the enzyme. In the pulsed state, cyanide binds slowly, but with high affinity. The ligand is posited to electrostatically stabilize both metals at once by positioning itself between them. A high nitric oxide concentration, such as one added exogenously to the enzyme, reverses cyanide inhibition of COX. Nitric oxide can reversibly bind to either metal ion in the binuclear center to be oxidized to nitrite. NO and CN will compete with oxygen to bind at the site, reducing the rate of cellular respiration. Endogenous NO, however, which is produced at lower levels, augments CN inhibition. Higher levels of NO, which correlate with the existence of more enzyme in the reduced state, lead to a greater inhibition of cyanide. At these basal concentrations, NO inhibition of Complex IV is known to have beneficial effects, such as increasing oxygen levels in blood vessel tissues. The inability of the enzyme to reduce oxygen to water results in a buildup of oxygen, which can diffuse deeper into surrounding tissues. NO inhibition of Complex IV has a larger effect at lower oxygen concentrations, increasing its utility as a vasodilator in tissues of need. Hydrogen sulfide will bind COX in a noncompetitive fashion at a regulatory site on the enzyme, similar to carbon monoxide. Sulfide has the highest affinity to either the pulsed or partially reduced states of the enzyme, and is capable of partially reducing the enzyme at the heme a3 center. It is unclear whether endogenous H2S levels are sufficient to inhibit the enzyme. There is no interaction between hydrogen sulfide and the fully reduced conformation of COX. Methanol in methylated spirits is converted into formic acid, which also inhibits the same oxidase system. High levels of ATP can allosterically inhibit cytochrome c oxidase, binding from within the mitochondrial matrix. Cytochrome c oxidase has 3 subunits which are encoded by mitochondrial DNA. Of these 3 subunits encoded by mitochondrial DNA, two have been identified in extramitochondrial locations. In pancreatic acinar tissue, these subunits were found in zymogen granules. Additionally, in the anterior pituitary, relatively high amounts of these subunits were found in growth hormone secretory granules. The extramitochondrial function of these cytochrome c oxidase subunits has not yet been characterized. Besides cytochrome c oxidase subunits, extramitochondrial localization has also been observed for large numbers of other mitochondrial proteins., This raises the possibility about existence of yet unidentified specific mechanisms for protein translocation from mitochondria to other cellular destinations. Defects involving genetic mutations altering cytochrome c oxidase (COX) functionality or structure can result in severe, often fatal metabolic disorders. Such disorders usually manifest in early childhood and affect predominantly tissues with high energy demands (brain, heart, muscle). Among the many classified mitochondrial diseases, those involving dysfunctional COX assembly are thought to be the most severe. The vast majority of COX disorders are linked to mutations in nuclear-encoded proteins referred to as assembly factors, or assembly proteins. These assembly factors contribute to COX structure and functionality, and are involved in several essential processes, including transcription and translation of mitochondrion-encoded subunits, processing of preproteins and membrane insertion, and cofactor biosynthesis and incorporation. Currently, mutations have been identified in seven COX assembly factors: SURF1, SCO1, SCO2, COX10, COX15, COX20, COA5 and LRPPRC. Mutations in these proteins can result in altered functionality of sub-complex assembly, copper transport, or translational regulation. Each gene mutation is associated with the etiology of a specific disease, with some having implications in multiple disorders. Disorders involving dysfunctional COX assembly via gene mutations include Leigh syndrome, cardiomyopathy, leukodystrophy, anemia, and sensorineural deafness. The increased reliance of neurons on oxidative phosphorylation for energy. facilitates the use of COX histochemistry in mapping regional brain metabolism in animals, since it establishes a direct and positive correlation between enzyme activity and neuronal activity. This can be seen in the correlation between COX enzyme amount and activity, which indicates the regulation of COX at the level of gene expression. COX distribution is inconsistent across different regions of the animal brain, but its pattern of its distribution is consistent across animals. This pattern has been observed in the monkey, mouse, and calf brain. One isozyme of COX has been consistently detected in histochemical analysis of the brain. Such brain mapping has been accomplished in spontaneous mutant mice with cerebellar disease such as reeler and a transgenic model of Alzheimer's disease. This technique has also been used to map learning activity in animal brain. ↑ Balsa E, Marco R, Perales-Clemente E, Szklarczyk R, Calvo E, Landázuri MO, Enríquez JA (September 2012). "NDUFA4 is a subunit of complex IV of the mammalian electron transport chain". Cell Metab. 16 (3): 378–86. doi:10.1016/j.cmet.2012.07.015. PMID 22902835. ↑ Tsukihara T, Aoyama H, Yamashita E, Tomizaki T, Yamaguchi H, Shinzawa-Itoh K, Nakashima R, Yaono R, Yoshikawa S (August 1995). "Structures of metal sites of oxidized bovine heart cytochrome c oxidase at 2.8 A". Science. 269 (5227): 1069–74. doi:10.1126/science.7652554. PMID 7652554. ↑ Voet, Donald (2010). Biochemistry. New York: J. Wiley & Sons. pp. 865–866. ISBN 0-470-57095-4. 1 2 3 4 5 Fontanesi F, Soto IC, Horn D, Barrientos A (December 2006). "Assembly of mitochondrial cytochrome c-oxidase, a complicated and highly regulated cellular process". Am. J. Physiol., Cell Physiol. 291 (6): C1129–47. doi:10.1152/ajpcell.00233.2006. PMID 16760263. ↑ Khalimonchuk O, Rödel G (December 2005). "Biogenesis of cytochrome c oxidase". Mitochondrion. 5 (6): 363–88. doi:10.1016/j.mito.2005.08.002. PMID 16199211. 1 2 Sedlák E, Robinson NC (September 15, 2015). "Destabilization of the Quaternary structure of Bovine Heart Cytochrome c Oxidase upon Removal of Tightly Bound Cardiolipin". Biochemistry. 54 (36): 5569–77. doi:10.1021/acs.biochem.5b00540. PMID 26284624. ↑ Herrmann JM, Woellhaf MW, Bonnefoy N (February 2013). "Control of protein synthesis in yeast mitochondria: the concept of translational activators". Biochimica et Biophysica Acta. 1833 (2): 286–294. doi:10.1016/j.bbamcr.2012.03.007. PMID 22450032. ↑ Soto IC, Fontanesi F, Liu J, Barrientos A (June 2012). "Biogenesis and assembly of eukaryotic cytochrome c oxidase catalytic core". Biochimica et Biophysica Acta. 1817 (6): 883–97. doi:10.1016/j.bbabio.2011.09.005. PMC 3262112 . PMID 21958598. ↑ Aledo JC, Valverde H, Ruiz-Camacho M, Morilla L, López FD (2014). "Protein-Protein Interfaces from Cytochrome c Oxidase I Evolve Faster than Nonbonding Surfaces, yet Negative Selection Is the Driving Force". Genome Biology and Evolution. 6 (11): 3064–76. doi:10.1093/gbe/evu240. PMC 4255772 . ↑ Zhang Z; Huang L; Shulmeister VM; Chi YI; Kim KK; Hung LW; et al. (1998). "Electron transfer by domain movement in cytochrome bc1.". Nature. 392 (6677): 677–84. doi:10.1038/33612. PMID 9565029. ↑ Kaila VR; Oksanen E; Goldman A; Bloch DA; Verkhovsky MI; Sundholm D; et al. (2011). "A combined quantum chemical and crystallographic study on the oxidized binuclear center of cytochrome c oxidase.". Biochim Biophys Acta. 1807 (7): 769–78. doi:10.1016/j.bbabio.2010.12.016. PMID 21211513. ↑ Szklarczyk R, Wanschers BF, Cuypers TD, Esseling JJ, Riemersma M, van den Brand MA, et al. (2012). "Iterative orthology prediction uncovers new mitochondrial proteins and identifies C12orf62 as the human ortholog of COX14, a protein involved in the assembly of cytochrome c oxidase.". Genome Biol. 13 (2): R12. doi:10.1186/gb-2012-13-2-r12. PMC 3334569 . PMID 22356826. ↑ Mick DU; Dennerlein S; Wiese H; Reinhold R; Pacheu-Grau D; Lorenzi I; et al. (2012). "MITRAC links mitochondrial protein translocation to respiratory-chain assembly and translational regulation.". Cell. 151 (7): 1528–41. doi:10.1016/j.cell.2012.11.053. PMID 23260140. ↑ Kozjak-Pavlovic V; Prell F; Thiede B; Götz M; Wosiek D; Ott C; et al. (2014). "C1orf163/RESA1 is a novel mitochondrial intermembrane space protein connected to respiratory chain assembly.". J Mol Biol. 426 (4): 908–20. doi:10.1016/j.jmb.2013.12.001. PMID 24333015. ↑ Gaisne M, Bonnefoy N (2006). "The COX18 gene, involved in mitochondrial biogenesis, is functionally conserved and tightly regulated in humans and fission yeast.". FEMS Yeast Res. 6 (6): 869–82. doi:10.1111/j.1567-1364.2006.00083.x. PMID 16911509. 1 2 Leavesley H, Li L, Prabhakaran K, Malmström BG (January 2008). "Interaction of cyanide and nitric oxide with cytochrome c oxidase: Implications for acute cyanide toxicity". Toxicological Sciences. 101 (1): 101–11. doi:10.1093/toxsci/kfm254. PMID 17906319. ↑ Alonso JR, Cardellach F, López S, Casademont J, Miró O (September 2003). "Carbon monoxide specifically inhibits cytochrome c oxidase of human mitochondrial respiratory chain". Pharmacol. Toxicol. 93 (3): 142–6. doi:10.1034/j.1600-0773.2003.930306.x. PMID 12969439. 1 2 Nicholls P, Marshall D, Cooper C, Wilson M (October 2013). "Sulfide inhibition of and metabolism by cytochrome c oxidase". Biochm. Soc. Trans. 41 (5): 1312–16. doi:10.1042/BST20130070. PMID 24059525. ↑ Jensen P, Wilson MT, Aasa R, Malmström BG (December 1984). "Cyanide inhibition of cytochrome c oxidase. A rapid-freeze e.p.r. investigation". Biochem J. 224 (3): 829–837. doi:10.1042/bj2240829. PMC 1144519 . 1 2 3 Gladwin MT, Shiva S (May 22, 2009). "The ligand binding battle at cytochrome c oxidase: how NO regulates oxygen gradients in tissue". Circ Res. 104 (10): 1136–8. doi:10.1161/CIRCRESAHA.109.198911. PMID 19461104. ↑ Arnold S, Kadenbach B (October 1997). "Cell respiration s controlled by ATP, an allosteric inhibitor of cytochrome-c oxidase.". Eur J Biochem: 350–254. 1 2 Sadacharan, S. K., Singh, B., Bowes, T. and Gupta, R. S. (2005). Localization of mitochondrial DNA encoded cytochrome c oxidase subunits I and II in rat pancreatic zymogen granules and pituitary growth hormone granules. Histochem Cell Biol. 124:409-421. ↑ Gupta, R. S., Ramachandra, N. B., Bowes, T. and Singh, B. (2008) Unusual cellular disposition of the mitochondrial molecular chaperones Hsp60, Hsp70 and Hsp10. Novartis Found Symp. 291: 59-68. 1 2 Soltys BJ, Gupta RS (1999). "Mitochondrial proteins at unexpected cellular locations: export of proteins from mitochondria from an evolutionary perspective". International Review of Cytology. 94: 133–196. ↑ Soltys BJ, Gupta RS (1999). "Mitochondrial proteins at unexpected locations: Are they exported?". Trends Biochem. Sci. 24: 174–177. doi:10.1016/s0968-0004(99)01390-0. ↑ Pecina P, Houstková H, Hansíková H, Zeman J, Houstek J (2004). "Genetic defects of cytochrome c oxidase assembly" (PDF). Physiol Res. 53 Suppl 1: S213–23. PMID 15119951. ↑ Zee JM, Glerum DM (December 2006). "Defects in cytochrome oxidase assembly in humans: lessons from yeast". Biochem. Cell Biol. 84 (6): 859–69. doi:10.1139/o06-201. PMID 17215873. ↑ Johar K, Priya A, Dhar S, Liu Q, Wong-Riley MT (November 2013). "Neuron-specific specificity protein 4 bigenomically regulates the transcription of all mitochondria and nucleus-encoded cytochrome c oxidase subunit genes in neurons". J Neurochem. 127 (4): 496–508. doi:10.1111/jnc.12433. PMC 3820366 . PMID 24032355. ↑ Wong-Riley MT. (1989). "Cytochrome oxidase: an endogenous metabolic marker for neuronal activity.". Trends Neurosci. 12 (3): 94–111. doi:10.1016/0166-2236(89)90165-3. PMID 2469224. ↑ Hevner RF, Wong-Riley MT (November 1989). "Brain cytochrome c oxidase: purification, antibody production, and immunohistochemical/histochemical correlations in the CNS". J Neurosci. 9 (11): 3884–98. PMID 2555458. ↑ Strazielle C, Hayzoun K, Derer M, Mariani J, Lalonde R (April 2006). "Regional brain variations of cytochrome oxidase activity in Relnrl-orl mutant mice.". J. Neurosci. Res. 83 (5): 821–31. doi:10.1002/jnr.20772. PMID 16511878. ↑ Strazielle C, Sturchler-Pierrat C, Staufenbiel M, Lalonde R (2003). "Regional brain cytochrome oxidase activity in beta-amyloid precursor protein transgenic mice with the Swedish mutation.". Neuroscience. 118 (4): 1151–63. doi:10.1016/S0306-4522(03)00037-X. PMID 12732258. ↑ Conejo NM, González-Pardo H, Gonzalez-Lima F, Arias JL (2010). "Spatial learning of the water maze: progression of brain circuits mapped with cytochrome oxidase histochemistry.". Neurobiol. Learn. Mem. 93 (3): 362–71. doi:10.1016/j.nlm.2009.12.002. PMID 19969098.